The major problem with contemporary scholars’ approach to Jesus’ resurrection is that they come to do the work of autopsy, not adoration. But Jesus Christ is the apex of all that is precious, the center of all that is glorious and delightful. He is the very point of existence. He is the Son of the living God, the Alpha and Omega, the first and the last who was and is and is to come. “O come let us adore Him!”—not scrutinize, utilize, or analyze Him. The personal claim the risen Jesus makes about Himself is that He is the God of the universe and that He deserves our awe, our reverence, our worship, our love, and our devotion. — Jared C. Wilson, Unparalleled, 149. In contrast with the difficulty of vocalizing YHWH, what is the English equivalent of the Hebrew phrase Hallelu-YAH? It’s simply Hallelu-YAH. How do you say the Hebrew phrase Hallelu-YAH in Greek? in Spanish? in German? in French? in Swahili? in Chichewa? in Luganda? It’s all the same in these languages, with minor differences in spelling. No translation is necessary. Indeed, the phrase may be rendered “Praise the LORD.” Yet it has achieved spontaneous universality. The Psalter has shown the way for the universe to praise its Creator and Redeemer. The Psalms consummate with Hallelu-YAH, and all nations and peoples can join in the joyful, spontaneous celebration. Even the ease with which the expression can be articulated deserves notice. In a remarkable way, the word Hallelu-YAH is particularly suitable for opening wide the mouth, dropping the jaw, and loudly shouting God’s praise. Try it! You Yourself s t r e t c h e d out the heavens. You are with cherubim-song ringed. That You would deign to bring me close? A Saraband is a musical dance form, originally Asian, that was introduced to Spain and later France and Italy. If Psalm 95 had a soundtrack, the record skips and scratches or the car brakes slam between the middle and end of verse 7. The first verses fit well within the surrounding psalms; the themes of singing, shouting, joy, and the greatness of God are all there. But beginning with the last line of verse 7, the song changes quick, fast, and in a hurry. I recently finished Fred Sanders’ (@fredfredsanders) John Wesley on the Christian Life: The Heart Renewed in Love. I was doubly drawn to the book: having read Sanders’ The Deep Things of God, I had been acquainted with his rich devotion to the faith once for all delivered to the saints (Jude 3) and his helpful, clear writing. The subject of the book also appealed to me; I knew very little about Wesley, other than scattered “facts” that were admittedly unverified and likely caricature. Since Sanders comes from a thoughtful Wesleyan perspective, I hoped I was in for a treat. This week’s Music Monday is a song from Austin Stone Worship’s latest album, King of Love. UPDATE: Jamie Brown has a behind-the-album post at Worthily Magnify. 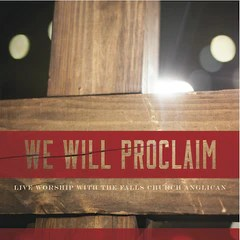 We Will Proclaim is the second live recording from The Falls Church Anglican.